This small wall-mounted desk / cabinet unit is designed for interior settings where space is limited. 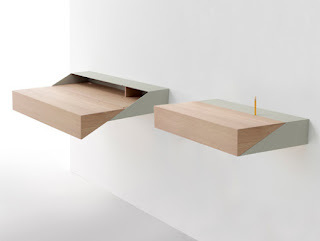 Deskbox can be extended outwards to reveal a larger work / writing surface, and easily retracted to form a closed, compact box which ends up half the size of the table top when not in full use. Conceived by Israel-born UK-based designers Yael Mer and Shay Akalay for Dutch Furniture Company ARCO. Multi-functional. Cleverly designed. Yummy. 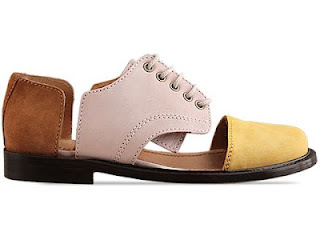 For a slightly older school version but just as cool, click. Peter Locke has a pretty wonderful and reasonably affordable idea to turn your refrigerator into a piece of art. 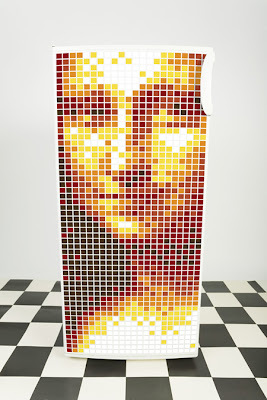 The 1296 colored magnets called Motifo act like giant, colored pixels you can arrange to create giant, vibrant mosaic imagery on your fridge door (or side, or top, or wherever else you can stick magnets to for that matter). The set comes with "six funky designs and full instructions" for creating them, and apparently many more are available on request. We're kind of in love with this idea. These delectable quilts and pillow covers lovingly made by Barbara Perrino are designed, cut and pieced one-at-a-time using top quality, 100% cotton fabric, thread and batting. 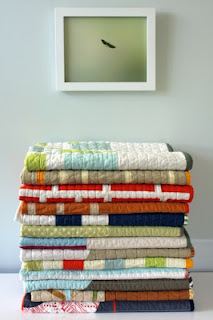 Although designs may be repeated, no two quilts are exactly alike. We like. 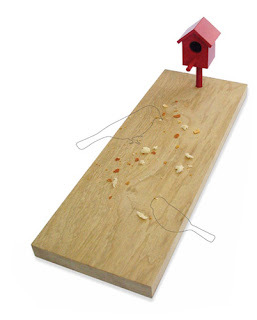 After dining, place this bread stand on the window ledge so birds can feast on the crumbs. Make friends with your winged neighbors, invite them for a meal. We love products that celebrates coexistence and the joy of sharing with friends. Speaking of dining tables for the holidays, check these out! 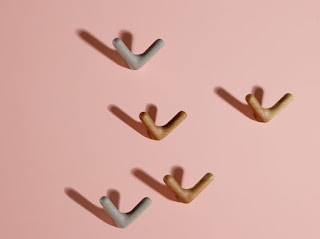 These sculptural hangers have been designed by the very great Karim Rashid. They can be hung on the back of the sofa as well as individual wall hangers. Thanks to laborious handcrafted lathe work, the oak wood acquires suggestive rounded shapes. From Sancal. 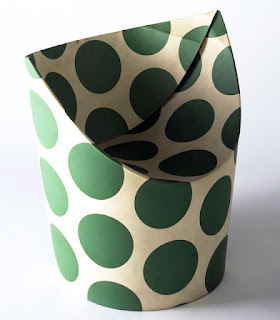 TURN by Norwegian designer Caroline Olssoninspired by the old workbench that is often used in wood workshops in Norway. You can decide how bright you want it to shine by turning the tightening mechanism. Turn is made of birch and mouth blown glass. Another great Norwegian? Finally, a sleeper sofa that actually is comfortable! The legendary Comfort Sleeper from American Leather is an innovative, modernistic, perfectly-crafted sofa that will be the proud centerpiece of any room. Its patented Tiffany 24/7 platform sleep system is designed without uncomfortable bars or springs and offers 5” of high-density foam for the ultimate guest experience. Available in 6 sizes and hundreds of fabric and leather options. And, yes, you guessed it, they are on sale at our Downingtown, Philadelphia and Mt. Laurel, NJ showrooms until Sept. 30th. These tabletops from the new collection by Cordula Kehrer combine ready-mades with traditional wickerwork. 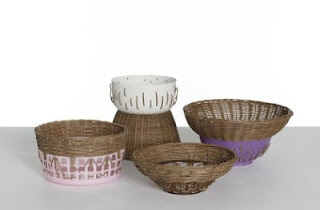 Relics of our throwaway society – that is, old and scratched plastic bowls – are “up-cycled”. The combination with an entirely different material and a completely different production technique creates originals just right for our modern times. Love these! just add socks! From Sweden with love--made in the European union. With Konstantin B, Nika Zupanc displays a playful nostalgia for a time when children had physical friends as toys rather than digital enemies. 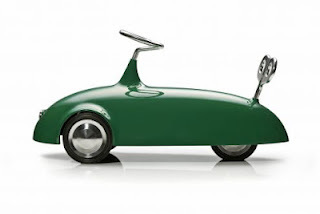 A sleek sit-on toy car featuring a lacquered epoxy body shell with aluminium and brass components, yes, it's for for little kids, but you can bet your bottom dollar that the big kid will want a ride too. Or at least put it on a pedestal. 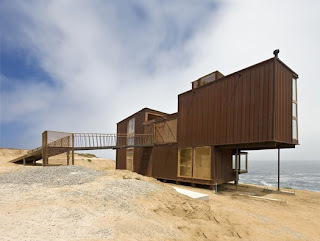 We want to live in this house just meters from the Pacific Ocean with "a predominantly opaque outer envelope of two inert materials: glass and weathering steel." Located in the Valparaíso Region of Chile, "The articulation of this structure is different on the two levels, creating different relationships with the Pacific horizon." Of course, we would fill generously with Scandinavian furniture! Created by Nicolás del Rio and Max Núñez. 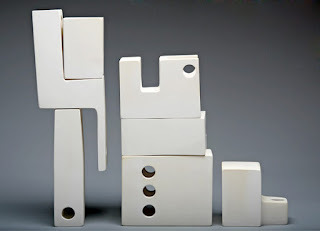 The possibilities and configurations are endless with these amazing ceramic sculptures by Andrew Molleur, aptly named Mod Man. It makes us think that you could own just one set of these and never have to buy new art again, just reconfigure them when you get tired of their current state. For more cool accessories, stop in at dane decor ASAP! We always thought moss would make great carpet. Apparently, so did Interface. 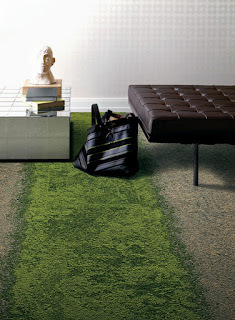 Check out Urban Retreat, the new carpet tile collection which explores the intersection of nature and man made materials. The collection juxtaposes seemingly opposite worlds that inspire beautiful, coexisting and functional design in interior spaces. Urban Retreat contains up to 85 percent recycled content including 100 percent recycled content fiber and high recycled content backing. Content yarn is derived from salvaged fishing nets with reclaimed carpet fiber! 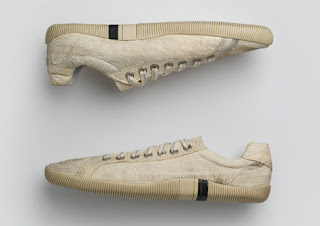 Osklen is a small sportswear brand from Brazil that uses reclaimed materials such as salmon skin to make shoes and accessories. Since 1999, designer and UNESCO ambassador Oskar Metsavaht has made environmental stewardship a key component of his company's DNA, with Osklen among the first Brazilian apparel labels to declare itself carbon-neutral. If you get to NYC, You can find Osklen in Soho. The address is 97 Wooster Street. 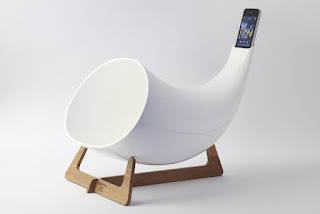 'Megaphone' is a speaker-like system which reverts to old school sound distribution. A ceramic form, simple and organic in shape, is gently contoured and designed to amplify and optimize sound output. A thin wooden frame props the body off of the table, increasing the vibration of the object and maximizing the emission of sound. Designed for use with the iPod and iPhone. Click for video. Kinda like the gramophone? We also have a pretty cool device in store from Geneva. 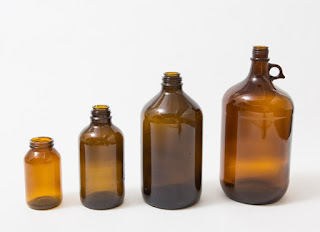 Utrem Lux is a series of lamps made from discarded glass bottles. Each one of the designs in the series is made individually by hand, boasting its own unique aesthetics. 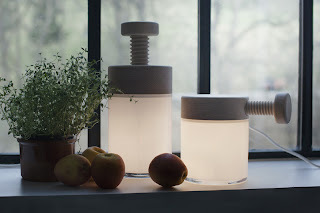 The series includes everything from planter-lamp hybrids to a desk lamp to a pendant. Check out their quasi-instructional “making-of” video here! We are very proud of our large collection of lights.